After long continuous researches on various Herbs, Ayurvedic medicines & successful clinical trials Robin Herbal Health Care Products has come up with the herbal hair kit which prevents baldness, stops unwanted hair fall, removes dandruff and promotes new hair growth and cure the issue of alopecia universalis. This product comes to you after years of hard work in isolation and circumscription using both herbal and Ayurvedic expertise and scientific work. The solution is there with us in AYURVEDA, Get rid of dandruff, Alopecia universalis issue and Itching in just 3 Applications. Its time to switch over to a reliable hair, product to have adorned hair. The hair product is works by not only preventing hair loss but also for the re-growth your hair naturally. Speaking of how safe it is, the, nothing is safer than Ayurveda. Ayurvedic hair loss treatment is an effectiveness treatment. The ancient system of medicine called Ayurveda, is found in India. It is the oldest health care system, given by Lord Brahma to King Indra and later it came to earth through renowned Rishis. Ayurveda is working on the principle of five basic elements of living beings. The five basic elements are earth, Jala- water, Agni- fire, Vayu- air, Akash- ether. These elements are the subtle aspects of human life, slender than the molecular, atomic, or subatomic levels. This helps the Vaidya to treat every patient individually, according to his own elemental constitution. In Ayurveda, pitta dosh causes hair fall. Excess of Pitta dosha in the body is the chief cause of all hair problems. Based on Ayurvedic principle, Dr. Narender Chawla has come up with a unique hair treatment. This medical treatment stimulates the hair follicles to help them grow naturally. Dr. Narender Chawla, an eminent ayuvedic scholiast, is the principal of Shri Laxmi Naryan Ayurvedic College, Amritsar. He has treated men, women and children suffering from various hair problems/ diseases over past 30 years of his ayurvedic career. Bhringaraaja: known as king of hair, Bhringraaja supports hair growth and effectively stops and reverses balding and premature greying. It helps to attain peace of mind which promotes sound sleep. Amla: Indian gooseberry has Vitamin C and other antioxidants. Neem: This is a natural remedy against dandruff and lice and has blood purifying abilities. Ritha: These are natural soap nuts that clean hair without stripping off the natural oils. Ashwagandha: Weakened immune system is one of the reason for hair loss. Ashwagandha makes you feel energized and healthier. It reduces stress, increases vigor and helps in the re-growth of lost hair. 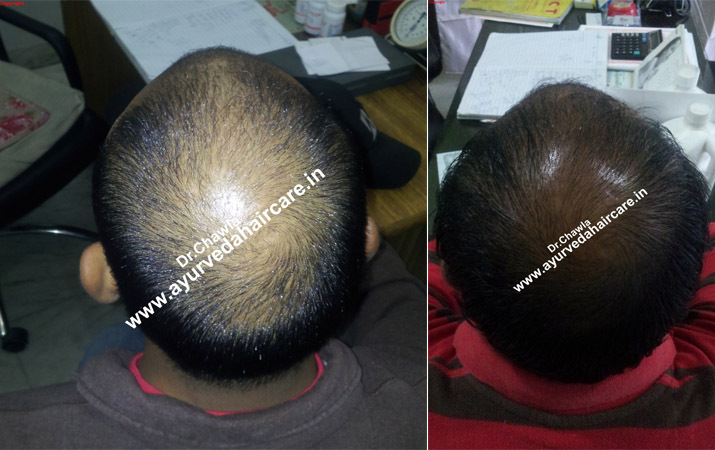 It is completely herbal, cost effective in comparison to costly hair transplant surgeries. It is pain less treatment as there is no need to take painful steroid injections . It does not affect your androgen levels and normal sexual activity like other allopathic medicines. No need to come every day to the clinic to take psoralen plus ultraviolet A (PUVA) for longstanding and widespread alopecia areata or Alopecia universalis. Apart from taking this hair treatment, one needs to have a good diet to say goodbye to hair troubles. Aloe vera: Befriend aloe vera juice. You can also take it with cumin thrice a day for about 3 months. After that, get ready to surprise everyone with the crowning glory of your hair! Sesame seeds: A handful of white sesame seeds each morning can be a great source of magnesium and calcium. They are very effective hair loss checkers. Take one glass milk daily day or night. Daily eat 5 almonds & raisins(soaked over ) early in morning. Green leafy vegetables and fruits: No one can underestimate vegetables and fruits for preserving hair fall, as they are rich in fibre which are an excellent in preventing hair fall. Vitamin C, vitamin B-complex, zinc, sulphur and some important fatty acids are very important to make the roots of your hair strong. You can find these nutrients in sprouts, yeast, buttermilk, nuts, milk, soy beans and whole grains. Include these in your diet and you can expect to reduce your hair fall in a few months. Alopecia Universalis: Alopecia Areata: This is the disorder in which hair starts falling and leave patches on scalp, beard, moustaches or any other part of the body. It leaves a shiny skin behind. Sometimes the hair grows back. In many cases the disease goes to the next level. In next level there is no hair on the scalp. On the contrary, if the patient still does not plan for the treatment then the disease can progress to its more worsen condition where hair disappear from the whole body and not single hair will be left even inside the nose or the pubic area. This Drastic hair loss condition is known as Alopecia Universalis. Hair problems do not cause any discomfort, pain or physical trauma to the patient and do not hamper his/her daily routine activities. Hair problems hurt a person mentally, as it makes him/her feel embarrassed cosmetically. Many a times, patients accept their bald looks confidently in society. This does not affect them mentally. There are other cases as well. People who are very possessive about their looks feel embarrassed. The embarrassment effects their mental and physical condition. Females feel more confident when they look presentable. They are more vulnerable to stress if they have hair troubles. In modern sciences, regrowth of lost hair is still a challenge. Western doctors are unable to find the main cause of such problem. They call it the auto-immune disorder. In this disorder very own body cells start destroying the other cells. 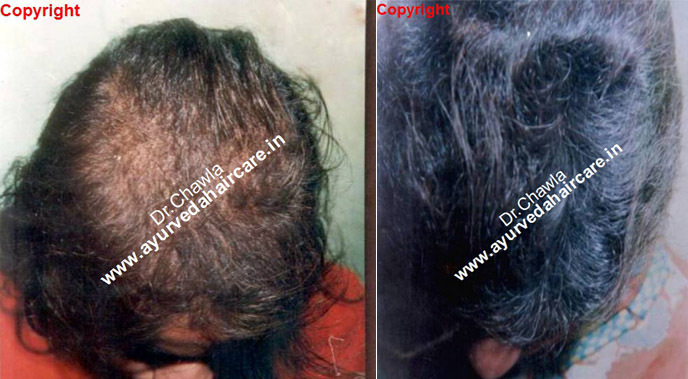 Acharyas in Ayurveda have written many hair diseases in detail. They termed it as Indralupta and clearly stated that the cause of such problem is Krimi i.e bacteria. There are 20 variety of krimis that are explained in the texts. Keshad, Lomad & Lomdweep are 3 types out of 20 which can lead to hair loss. There are many hidden secrets in the ayurvedic books since 5000 years. For 40 years Dr N.K Chawla (Ex Principal) has done continuous and extensive research on ayurveda. He has developed many good ayurvedic formulations along with Panchakarma techniques. 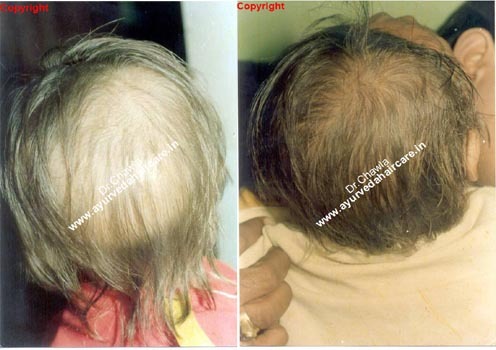 which has helped thousands of patients in re-growth of their hair. Rishi patch oil, Rishi grow oil, Robin plus herbal shampoo and many more can be added to his list of formulations. Testimonials showing results can be seen on his websites and Youtube channel. If you are suffering from Hair loss conditions, Alopecia Areata, Alopecia Totalis, Alopecia Universalis, Alopecia Barbae, Alopecia in children or an adult, then immediately book appointment with our experts before it extends to next level.